X-Large Fall Armyworm Caterpillar Population Should Be Past. The X-large population of fall armyworm (FAW) caterpillars generated by the X-Large population of FAW moths in late August (as indexed by UK-IPM trap counts, See: KPN 1245 Aug 31, 2010) should be past. This does NOT mean that the threat from FAW is over. It simply means that the large pulse of caterpillars generated by the extraordinary number of moths have completed the damaging stage of their life cycle. We do have evidence (especially forage fields having to be treated a second time) that this pulse did cause some producers x-tra trouble. My best guess is that the FAW caterpillars produced from the X-large moth flight are now in the pupal (resting) stage, from which adult moths will emerge. So it is possible that another large flight could occur this fall, depending upon temperature. The only other recent, large, fall occurring, FAW population for which we have record, occurred on Oct. 5, 2007. This led to large numbers of FAW mostly feeding on volunteer corn (fortunately) in area wheat fields. Regardless of whether or not we see another large surge of moths, FAW caterpillars will be present until at least the first killing frost and one should continue to monitor crops at risk. By now corn and most soybeans and sorghum are no longer in danger. Grass and alfalfa forages, especially newly established stands are at greatest risk. Additionally, any newly established grass stands including wheat, lawns and grass covers for construction and reclamation should be watched. Corn, soybeans, and wheat prices continue to be volatile due to market uncertainty. The most unknown factor is the size of this year’s crop. The USDA has helped paint some of the picture by reducing the U.S. corn crop by more than 200 million bushels between August and September to 13.1 billion bushels. For soybeans the U.S. crop was increased by 50 million bushels between August and September to 3.48 billion bushels. Exports represent another factor influencing prices. In the September USDA report, corn exports were increased by 50 million bushels and soybean exports were increased by 50 million bushels. With a decrease in the size of the corn crop and an increase in exports (plus a decrease in corn for feed) between the August and September USDA report, ending stocks were reduced by 196 million bushels to 1,116 billion bushels. For soybeans, ending stocks were slightly reduced by 10 million bushels to 350 million bushels. Corn prices continue to advance higher on 9 month highs. December 2010 corn has broken through $5.00 and is approaching $5.25. Are these profitable prices? Given your yields, are they? – This is the question that needs to be answered. If they are profitable, then selling in small percentages during this rally should happen. Additionally, the corn market is offering a reward for storing (a sign that the traders don’t think we are running out of corn). $0.12 is being offered in the futures market for holding corn from the December contract to the March contract. Taking this plus some strengthening in basis there will likely be a positive return to storage. I recommend locking in the futures side some time over the next few weeks and leaving basis float. Do not ignore 2011 prices, December corn is trading around $4.80. Soybean prices also continue to advance higher on 9 month highs. November 2010 soybeans are trading around $10.80. Given your yield potential, are these prices profitable? The soybean market is not offering much of a return to storage because the difference between the January and November contract is only $.10 and basis is moderately strong. Keep in mind November 2011 soybeans; they are trading around $10.70. More strange things are being reported in the corn crop this year. Last week, a producer called to say he was checking ears and the kernels were falling off of the cob. Even stranger, the kernels looked deep, the cob appeared to be of decent quality, but when he pulled back the husks, many of the kernels simply fell off the cob. When these ears hit the snout of the corn head, the kernels simply shattered off of the cob and onto the ground. In a year when high heat and low rains late reduced yield, loosing kernels to the soil is adding insult to injury. We suspect this to be a late-season stress occurring at or close to blacklayer (physiological maturity). The shattering kernels may be a result of both environment and genetics. So, if you have seen shattering kernels this year, please send me an email letting me know the name of the hybrid, the field location (nearest town), soil type and as much management information as you know. My email address is cdlee2@uky.edu. Thanks. Note: The following is an update on fertilizer practices in Argentina over the past 20 years. The changes in fertilizer practices over time in Argentina are impacting fertilizer demands in a global fertilizer economy. It will soon be spring in Argentina, and fertilizer purchase decisions are being made. Unlike the U.S., where fertilizer use has been a common practice for many years, Argentina’s linear growth in fertilizer use began only 20 years ago (Figure 1). This increased use of fertilizers has been associated with a continued increase in crop yield (Figure 2). It should be noted that the severe drop in fertilizer use in 2008 and 2009 was due to a reduction in the area of corn and wheat,with a corresponding increase in the area of soybean. Figure 1: Fertilizer consumption in Argentina, from 1990 to 2009. Figure 2: Annual grain (corn, soybean and wheat, averaged together) yield in Argentina, from 1990 to 2009. The nutrients most commonly purchased in Argentina are, in declining importance, nitrogen (N),phosphorus (P), sulfur (S), and potassium (K). Most soils found in the more productive region of Argentina (the Pampas) have high levels of bioavailable P because the soil parent material is rich in this nutrient. The use of S is increasingly common, as deficiencies of this nutrient are being increasingly detected. The soils of the Pampas are richer in bioavailable P, in comparison with soils found in other agricultural regions in Argentina. However, Darwich (1999) has reported significant declines in bioavailable P in these soils, relative to original levels, relative even to levels existing in the early 1980’s. 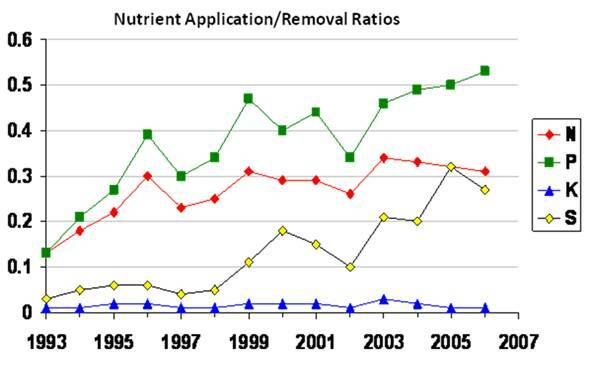 Despite the large increase in fertilizer use in the past 20 years, nutrient replenishment (replacement of nutrients removed in grain) is still very low and a topic of long-term concern.The fraction of total nutrient uptake that is recycled back to the soil averages about 34%, and replenishment of nutrient stocks with fertilizer averages about 41% for N, 61% for P, 6% for K,and 35% for S. This suggests that these soils will be progressively poorer in their fertility. This problem was also evaluated by Ciampitti and Garcia (2008), for soils of the Pampas region, and they concluded that only 31, 53, 1 and 27 % of the N, P, K and S, respectively, exported by crop harvest was replaced by fertilizer addition. The situation has been improving with time, though only slightly (Figure 3). Phosphorus and sulfur replacement have made slow but steady progress, in part because fertilizers containing these nutrients are now being more routinely applied to soybean, the crop with the largest production area in Argentina. The Argentine fertilizer industry, as well as various Argentine governmental institutions, expects increased fertilizer consumption and greater nutrient replenishment, especially for nitrogen. This expectation is based on anticipated increases in the production areas of both wheat and maize. In Argentina, these cereal crops are generally better fertilized than soybean. Current wheat and maize production areas are now at their lowest levels in 30 years. In conclusion, Argentine nutrient management is generally characterized by a negative soil nutrient balance, due to rates of replacement/fertilization that are lower than rates of removal. This has resulted in declines in bioavailable N, P, K, and S levels in Argentine soils. Given this context, appropriate fertilizer rates and sources are important to crop production in Argentina, slowing/preventing nutrient export and depletion of soil fertility. Diagnosis of the fertility needs for a field is based in knowledge of the field’s soil and soil testing is important to that knowledge base. Soil chemical analysis and good nutrient management practices are tools indispensable to sustainable Argentine agriculture. 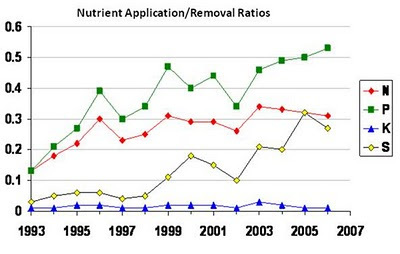 Figure 3: Nutrient application/removal ratios in Argentina from 1993 to 2007. Darwich N. 1999. Niveles de P disponible en suelos pampeanos. (Levels of bioavailable P in soils of the Pampas). IDIA 409-412: 1-5. INTA. Buenos Aires, Argentina. Ciampitti I., F. Garcia. 2008. Fosforo en rotaciones agrícolas de la región pampeana central: II. Balance de P. (Phosphorus in agricultural rotations in the central Pampas region: II. P balance). Actas CD XXI Congreso Argentino de la Ciencia del Suelo. AACS. Potrero de los Funes, San Luis.